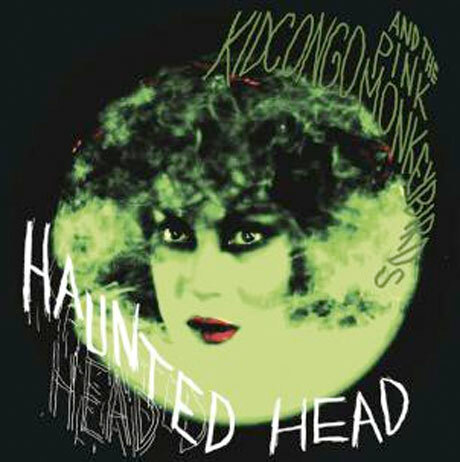 Kid Congo Powers is known for his role in bands like the Gun Club, the Cramps and Nick Cave and the Bad Seeds, but in recent years he's been releasing albums under the name Kid Congo and the Pink Monkey Birds. His latest album with this project is called Haunted Head, and it's out on May 28 through In the Red Records. The album was recorded by Powers and his longtime collaborators Kiki Solis (bass), Ron Miller (bass) and Jesse Roberts (guitar), with Roberts handling engineering duties and Miller mixing at Harveyville Project in Harveyville, KS. According to a press release, Haunted Head is a "cocktail of fuzz guitars, New Orleans drum beats, soulful strut bass lines and sonic ambrosia." It reportedly includes ballads, along with more rollicking and punk-leaning numbers. The announcement further describes the album like this: "Waking from a nap in the swamps of outer space, Kid Congo and the Pink Monkey Birds ride a geisterbahn into the hypnagogic, a place between sleep and consciousness also known as the Haunted Head." This album comes hot on the heels of a new 7-inch featuring two exclusive tracks, "Conjure Man" and "Lose Your Mind." The A-side is an original while the flip is a cover of a tune by the Seeds. It's available through In the Red's website. Watch a video for "Conjure Man" below.